Manufacturer of a wide range of products which include ultrasonic plastic geyser outerbody welding machine and ultrasonic geyser body welding machine. Ultrasonic Geyser Outerbody Welding Machine easy operating system, easy to weld with Material ABS Sheet, 1.2 -1.5mm x 2 thickness with overlapping and strip base welding upto 600mm in single shot.. Machine have Ultimate features, PLC Controlled, low cost, time saver. Size of ABS Sheet can be adjust as per size of Geyser tank capacity. No. of Ultrasonic Systems: 2 Nos. No. of Ultrasonic Systems 2 Nos. 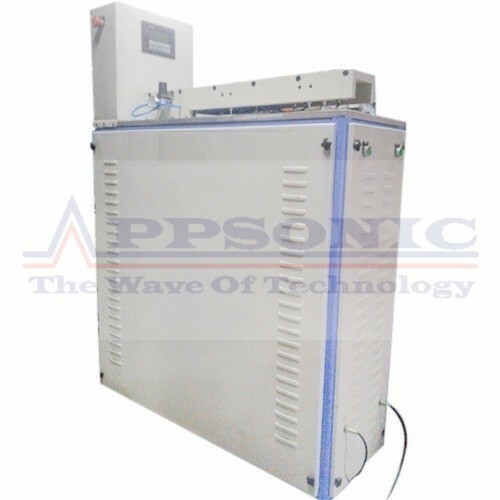 Looking for “Ultrasonic Geyser Welding Machine”?